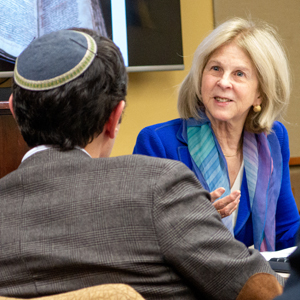 Dr. Elaine Pagels, the Harrington Spear Paine Professor of Religion at Princeton University, gave a talk on Thursday, October 25, on how ancient sources from a variety of traditions go about interpreting the Book of Genesis as part of the Seminar on Ancient Judaism, an initiative co-sponsored by the Office of the Provost, Yeshiva University and the Bernard Revel Graduate School of Jewish Studies. 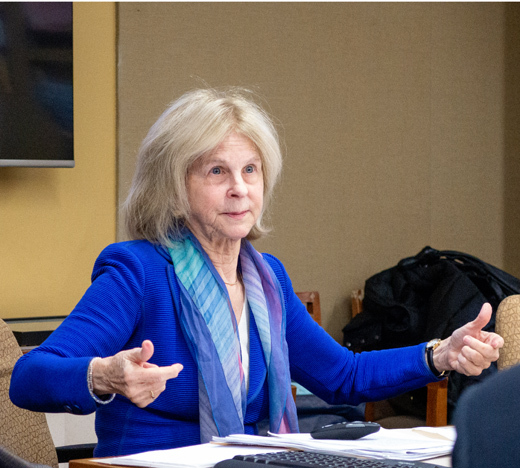 Dr. Pagels is best known for her research into early Judaism and its relationship with Christianity as well as the so-called gnostic traditions that later church fathers would deem heretical. She is best known as the author of The Gnostic Gospels, published in 1979, which explored conflicts in the early history of Judaism and Christianity as revealed in the Nag Hammadi library, 13 leather-bound papyrus books discovered near the Egyptian town of Nag Hammadi in 1945. A work attributed to a mysterious ancient figure named Thomas, the subject of Pagels’ 2003 book Beyond Belief: The Secret Gospel of Thomas, was found among the papyrus volumes. It contains a collection of sayings which, according to Pagels, shed greater light on how people living in and around the land of Israel in the first two centuries CE thought about and interpreted the first two chapters of Genesis. There are three more lectures planned for the Seminar: Shai Secunda (Bard College) on Thursday, February 14, 2019; Loren Stuckenbruck (University of Munich) on Thursday, March 14, 2019; and Sarit Kattan Gribetz (Fordham University) on Thursday, April 4, 2019. For more information, contact Rabbi Ari Mermelstein at mermels@yu.edu.